Join San Diego Harley-Davidson for their famous UFC Fights Nights! This is a FREE event if you choose to watch the fights on our main showroom floor, and only a paid $10 ticket if you would like to watch the fights in our private VIP event space decked out with leather couches. Our VIP room has leather couches, a free nacho bar and a true theater setup with projector and 200" screen. 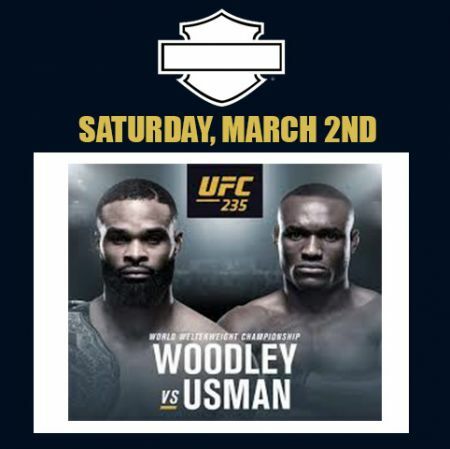 For UFC 235 we will be serving our VIP guests complimentary hot nachos. We will also have a made to order tacos outside for everyone! Bar will be fully stocked with your favorite beer, wine and soda! Our UFC Fight Nights are always a blast and you don't want to miss this fight card!